Rami Kujanpää didn’t hesitate when he was asked by Aalto EE whether he’d be interested in collaborating with the Finnish Red Cross. Aalto EE alumni and the Finnish Red Cross launched Red Cross Ambassador activities in the spring of 2017, and Kujanpää was among the first volunteers. The purpose is to communicate the needs and collections of the Red Cross through alumni and their employers. It all began in 2015, when Aalto EMBA alumnus Domenicio Dargenio suggested that alumni should be involved in helping non-profit organizations. Riitta Lumme-Tuomala, Head of Growth (Marketing & Communications) at Aalto EE, began to develop the idea, and cooperation with the Finnish Red Cross was launched a few months later. The mood at the first workshops was enthusiastic and the parties involved felt the collaboration was meaningful. It led to a decision to collaborate in the long term, and the concept of Red Cross Ambassadors was born. Linking together an individual’s desire to help with alumni networks could create an exceptional form of collaboration with non-profit organizations." The idea first came to Domenico Dargenio, Head of Operational Excellence at Wärtsilä, after discussing circular economy with participants and professors at the Aalto Executive Summit in the summer. According to Dargenio, he understood that linking together an individual’s desire to help with alumni networks could create an exceptional form of collaboration with non-profit organizations. What exactly is expected from Red Cross Ambassador Rami Kujanpää? Above all, to spread the message actively. “If the Red Cross needs citizens to get involved in humanitarian work, charity, collections or donations, we hear about it and take our organizations along”, says Kujanpää. The activities are not full-time, but designed to fit in the agendas of alumni who spend the day working. Kujanpää’s employer CGI is showing a good example to other companies. After Kujanpää sent a message to his supervisor to ask whether the intranet of the company’s Finnish office could be used to inform about crisis collections for the Finnish Red Cross, permission was granted first thing Monday morning. “It makes an employee feel good”, Kujanpää praises, who managed to spread an urgent plea of the Red Cross to the computer monitors of thousands of employees in less than an hour. 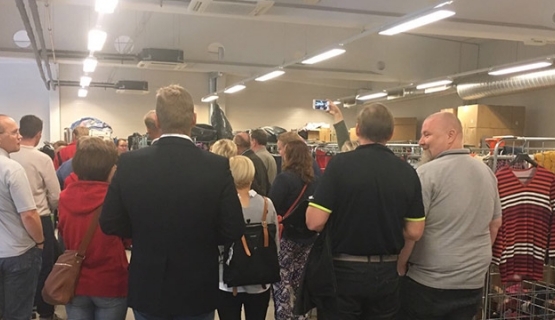 The newly elected group of approximately twenty ambassadors met together for the first time at the logistics center of the Finnish Red Cross in Kalkku, Tampere, where they heard about activities from Kalle Löövi, Director of International Operations of the Finnish Red Cross. Kujanpää says the meeting spurred him on in the work. Now Aalto EE alumni are ready and available in dozens of companies to spread the news about the needs of the Red Cross. “The new role as a Red Cross Ambassador improves the quality of life”, Rami Kujanpää sums up his experience so far. Our mission is to offer our alumni an access to the latest knowledge and an extensive global network. Together with our alumni and Aalto University we build lifelong networks and partnerships by providing developing opportunities enhancing our alumni’s personal brand, quality services and benefits. Read more about Aalto EE alumni activities.